Thank you for volunteering! It is only through the generosity of our volunteers that we can put on such great racing! 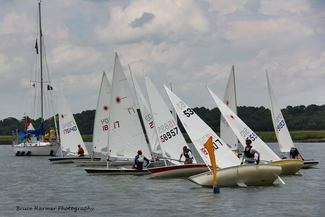 Volunteer slots for our Dinghy Spring Series are open! Details for volunteering are below. For the Spring Dinghy Series we are using a full race committee and will accept volunteers for all positions on the Sign Up Genius page. Volunteers are asked to be at the club and check in with the PRO at 12:30 pm to assist the PRO on all Sunday's. Warning signal for Sunday races is 2pm. Sunday, May 19, 2019 (first horn @ 2pm). Available for anyone considering being a race volunteer but would like additional training before taking on an official position. Please indicate if you intend to use your personally owned boat. Please indicate if you intend to use your personally owned boat. Volunteers for a third safety boat are not required for racing but are a welcome addition if we have enough volunteers. We cannot offer volunteer hours for this position. Volunteers for a third safety boat are not required for racing but are a welcome addition if we have enough volunteers. We cannot offer volunteer hours for this position. This will be my first time filling this position. Pro needing backup please sign up for top spot.